Dividing whole numbers is the opposite of multiplying whole numbers. It is the process by which we try to find out how many times a number (divisor) is contained in another number (dividend). When the dividend is bigger than 100, the answer may not be obvious. In this case you need to do long division. Study the following example (462 ÷ 3) carefully. It is not easy to see immediately how many times 3 is contained into 462. It may not be easy also to see how many times 3 is contained into 46. However, it is fairly easy to see that 3 is contained into 4 once. Therefore, we do this in step 1 and put the 1 above the 4. In step 2, we multiply 1 by 3 and subtract the answer(3) from 4. In step 3, we bring down the 62. Now, we need to find out how many times 3 is contained in 162. Still, it may not be obvious, so we will try to find out instead how many times 3 is contained into 16. 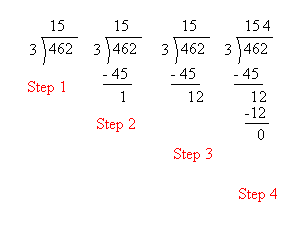 This is done in step 4 and we see that 3 is contained into 16, 5 times. We put the 5 above the 4. 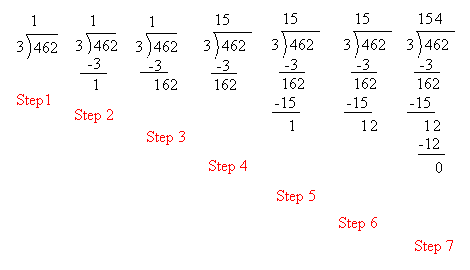 In step 5 , we multiply 5 by 3 and subtract the answer (15) from 16. In step 6 , we bring down the 2. In step 7 , we try to find out how many times 3 is contained into 12. 3 × 4 = 12, so 3 is contained into 12, 4 times. Finally, we put the 4 above the 6.